During the occurrence and development of injury (trauma, hemorrhagic shock, ischemia and hypoxia), the neuroendocrine and immune system act as a prominent navigation leader and possess an inter-system crosstalk between the reciprocal information dissemination. The fundamental reason that neuroendocrinology and immunology could mix each other and permeate toward the field of traumatology is owing to their same biological languages or chemical information molecules (hormones, neurotransmitters, neuropeptides, cytokines and their corresponding receptors) shared by the neuroendocrine and immune systems. The immune system is not only modulated by the neuroendocrine system, but also can modulate the biological functions of the neuroendocrine system. The interactive linkage of these three systems precipitates the complicated space-time patterns for the courses of traumatic inflammation. Recently, compelling evidence indicates that the network linkage pattern that initiating agents of neuroendocrine responses, regulatory elements of immune cells and effecter targets for immune regulatory molecules arouse the resistance mechanism disorders, which supplies the beneficial enlightenment for the diagnosis and therapy of traumatic complications from the view of translational medicine. Here we review the alternative protective and detrimental roles as well as possible mechanisms of the neuroendocrine immune responses in traumatic inflammation. Keywords: trauma and injury, stress, infection, hormones, neuroendocrine system, immunity, translational medicine. It is a long time since the sage of the past (Galen, a Greek Physician; Bian Que, a Chinese physician) had noticed the inextricably functional linkage between immune and nervous systems. The sophisticated relationship between neuroendocrine and immune responses was initially confirmed by the experiments of Ishigami's phagocytosis in 1919 and Metalnikov's conditioned reflex in 1924. Then Hans Selye, a Hungarian endocrinologist, named the specific phenomenon as stress. "Every stress leaves an indelible scar, and the organism pays for its survival after a stressful situation by becoming a little older." Trauma is just a severe stress that most of the organisms inevitably encounter during their lives. In the early phase of trauma, the stressful response occurs with the aid of pain, ischemia, hypoxia, etc. [1-4]. Within the immediate neuroendocrine immune reflex, the mediators (hormones, neurotransmitters, neuropeptides, cytokines and inflammatory mediators) are synergistically involved in the aseptic and adaptive inflammation via the regulation of the amount and bioactivity [5-9]. Under the guidance of biological activities of fight or flight, the injured bodies may succumb to successive infections from wound surface or intestinal ducts [10, 11], which may consequently result in the uncontrolled inflammation. During these courses, crosstalk between the neuroendocrine and immune systems, the congenerous captains of their own ship, can result in the production of factors by the nervous and endocrine systems , which synergistically alters immune function and subsequent immunomodulation against successive infectious agents and other pathogens in trauma. Thus, during the courses of remedy for trauma patients, the injured bodies showed the varying inflamed state (low, moderate, excessive) owing to the changes of regulatory ability of the neuroendocrine immune network. Studies involving either anti-inflammatory or pro-inflammatory agents further suggest that the local inflammation produced by injury is important for organ regeneration . It significantly determines the dynamic changes of vital organs, which is related to the outcome of trauma patients. Therefore, it is of magnificent values to ideally rein the dynamic equilibrium of neuroendocrine immune responses for the inflammatory response, structural remodeling and functional repair in trauma. The traumatic inflammation refers to the multiple aspects of neuroendocrine immune network (Figure 1). Brain can play an immunomodulatory role, whose functions are mostly elucidated in homeostasis maintaining of the immune system in response to changes of the environment [13-16] while the immune system possesses the sensing ability [13, 17-19]. The central and peripheral nervous systems linked in countless ways to the immune system. Through anatomical analysis, the encephalic locus involved in the immune regulation at least includes the dorsolateral prefrontal cortex (DLPFC), orbitofrontal cortex (OFC), medial prefrontal cortex (MPFC), hypothalamus, pituitary, locus ceruleus (LC), hippocampus and medulla oblongata in trauma. Hypothalamic-pituitary-adrenal (HPA) axis and autonomic nervous system (ANS) (mainly sympathetic and parasympathetic nerve) play a hinge locus [20-22]. Thus, circulating inflammatory molecules have the ability to target their cognate receptors at the levels of blood-brain barrier (BBB) under the orchestration of integrated responses in trauma. Other links also include the scattered neuroendocrine immune reflex arc in organs (intestine , skin [24, 25], adrenal gland [26, 27], bone marrow [28-31], etc.). Neuroendocrine-immune interactions can be conceptualized using a series of feedback loops, which culminate into distinct neuroendocrine-immune phenotypes . Thus, changes in the peripheral nervous system at the site of local inflammation might be hallmarks of traumatic complications. Schematic drawing of neuroendocrine immune pathways involved in the regulative mechanisms of traumatic inflammation. 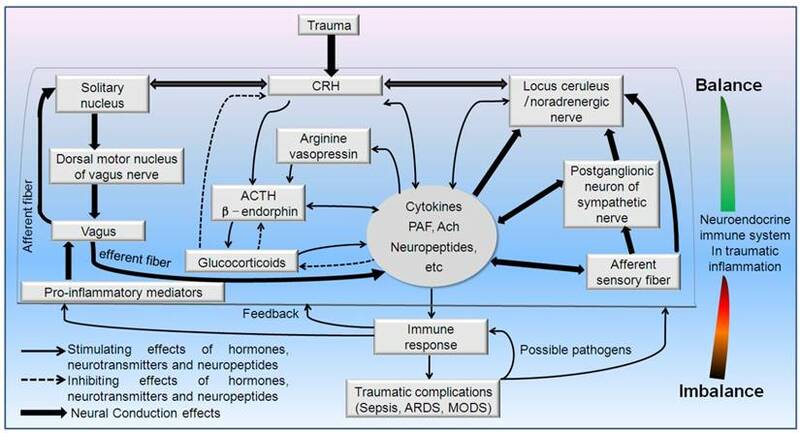 Hypothalamic-pituitary-adrenal (HPA) axis, sympathetico-adrenomedullary (SAM) axis and cholinergic pathway synergistically involved in the immune-mediated inflammation in trauma. PAF: platelet activating factor. CRH: Corticotropin-releasing hormone, Ach: Acetylcholine, ACTH: adrenocorticotropic hormone. The in vivo hormones, neurotransmitters and neuropeptides possess the robust immunomodulatory capacity [33-35]. In turn, the immune system informs the neuroendocrine system [23, 36]. Meanwhile, many other cells including endothelial cells in brain ventricle, microglia, and atrocities can also release multiple immunomodulatory elements of the central nervous system (CNS). Also, the neuronal and endocrinal cells may receive immune signals via their corresponding immune-related receptors (cytokine receptors, pattern recognition receptors, chemokine receptors, nuclear receptors) [37-43]. Concurrently, the immunocytes release various cytokines (lymphokines, monokines, etc.) to affect the neuroendocrine responses as well as sensing the local or distant stressful signals [43-45] termed “flowing brain”. The sharing of ligands and receptors allows the immune system to serve as the sixth sense notifying the nervous system of the presence of foreign entities . Thus, brain and immune systems may interact reciprocally via the route of nerve and body fluids [4, 23, 28, 44]. The standing and flowing brain act just as a vivid mirror of immune responses. Among them, one of the most typical findings is Ghrelin, an endogenous ligand for growth hormone (GH) secretagogue receptor (i.e., ghrelin receptor) [47, 48] and one of the first hormones rapidly increasing in the human physiological response to bacterial endotoxic shock . It was demonstrated to mediate the increased vascular sensitivity in the hyperdynamic phase of sepsis  in addition to its effects on GH release and energy homeostasis in traumatic infections. Ghrelin could inhibit pro-inflammatory cytokine production, mononuclear cell binding, and Nuclear factor-κB (NF-κB) activation in human endothelial cells in vitro and endotoxin-induced cytokine production in vivo . Conversely, the reduced central (brain) responsiveness to ghrelin due to the decreased GH, plays a major role in producing the hyper-inflammatory state, resulting in severe organ injuries and high mortality after endotoxemia in aged animals . It has sympathoinhibitory properties that are mediated by central ghrelin receptors involving a NPY/Y1 receptor-dependent pathway . Ghrelin's inhibitory effect on TNF-α production in sepsis is partially because of its modulation of the overstimulated sympathetic nerve activation . It also improved the tissue perfusion in severe sepsis, which might be mediated by down-regulation of endothelin-1 (ET-1) involving a NF-κB-dependent pathway . High ghrelin levels have been considered to be a positive predictor of ICU-survival in sepsis patients  besides its potential therapeutic use . Collectively, the immune system is regulated via the secretion of neuron hormones and peripheral ANS while the peripheral immune signals are transmitted into the brain via the cytokines and afferent activities of vagus in trauma. The complicated interactions included the stimulating, inhibitory and modulating effects of these common biological stimuli (hormones, neurotransmitters, neuropeptides and inflammatory mediators) [56, 57]. In severe traumatic stress, the hypothalamus integrates signals from peripheral systems through afferent sympathetic, parasympathetic, and limbic circuits converging to the paraventricular nucleus (PVN), which translates into neuroendocrine perturbations, altered neuronal signaling . First, the activation of HPA axis resulted in the releasing of corticotropin-releasing hormone (CRH) in the PVN, a central cellular switchboard, into the hypophyseal portal system. CRH could then stimulate the secretion of hypophyseal adrenocorticotropic hormone (ACTH) and the downstream glucocorticoids in adrenal glands [59, 60]. Actually, CRH may modulate the immune responses in trauma via two pathways: an anti-inflammatory one operated by centrally released CRH, most likely through stimulation of glucocorticoid and catecholamine release, and a pro-inflammatory one, through direct action of peripherally released CRH [61-63]. Researchers showed that CRH deficiency disrupted endogenous glucocorticoid production and enhances allergen-induced airway inflammation in mice . However, CRH deficiency impairs but does not block pituitary-adrenal responses to diverse stressors , further suggesting that pituitary-adrenal activity is augmented by factors besides CRH in trauma. Generally, trauma-induced glucocorticoids act as a neuroendocrine alarm signal of danger in a manner of non-physiologically pulsatile fashion. The bidirectional roles of glucocorticoids in modulation of inflammation may change therapeutic strategy at least via the regulation of inflammatory genes for inflammatory diseases . Concurrently, Glucocorticoids also regulate inflammatory responses via non-genomic pathways in cytoplasm and mitochondria. Crosstalk between HPA-axis-increased glucocorticoids and mitochondrial stress determines immune responses and clinical manifestations of patients with sepsis . Previous results further indicated that glucocorticoids bestow its suppressive effects via its low-affinity glucocorticoid receptor (GR) and its permissive effects via the high-affinity mineralocorticoid receptor (MR) in the acute inflammatory response . The neuroendocrine control of the innate immune system by glucocorticoids is critical for the delicate balance between cell survival and damage in the presence of inflammatory mediators . Actually, glucocorticoids produce a persisting sensitization of CNS innate immune effectors so that they will generate a potentiated pro-inflammatory response after the glucocorticoid rise has dissipated, thereby enhancing the sickness response to trauma or succeeding infections and maximizing the animal's ability to neutralize danger . The emerging evidence highlights both pro-inflammatory and anti-inflammatory actions of glucocorticoids on both the innate and adaptive immune systems. In this framework, they are ready to reinforce the innate immune system, and repress the adaptive immune system , to help to resolve inflammation and restore homeostasis in injured lungs , the most common target organ in trauma. Thus, HPA axis is the principal anti-inflammatory pathway in traumatic inflammation. The destruction or disabling of HPA axis may promote the development of traumatic complications [73, 74]. Growing evidence has proved that the ex vivo usage of endotoxin and IL-1 activated the HPA axis via the body fluid route or vagus [75, 76], which synergistically propel the pathogenesis of traumatic inflammation and sepsis. Additionally, the melatonin released from hypophyseal portal system could maintain the pro- and anti-inflammatory balance by influencing leukocyte migration and apoptosis in carp . Also, the adrenal medulla may directly integrate neuronal, hormonal, and immune signaling during inflammation, through induction of paracrine factors that signal to both adrenal cortex and sensory afferents of the adrenal gland, and autocrine factors , which determine the duration and type of paracrine secretory signaling in traumatic inflammatory conditions, both suggesting the provincial complicated modulating effects for the axis. Thus, studies of HPA axis activation on the outcome of trauma patients remain needed. Concurrently, the sympathetic nervous system is initiated via PVN and LC once trauma occurs, inducing the releasing of catecholamine (CA) through the ending of autonomic nerves and adrenal medulla [79, 80]. The ANS belongs to the neuromodulatory route secondary to the HPA axis in traumatic inflammation. The norepinephrine releasing from the sympathetic nervous ending could affect the immune system . It was reported that a suppressive role for noradrenergic innervation on the hemorrhage-induced increase in lung TNF-α content in vivo . The effects of norepinephrine are protective from lung injury but maybe contribute to the generalized immunosuppression in severe trauma. Meanwhile, Beta-blockade of propranolol can protect against the detrimental effects of trauma on lungs by blunting the exaggerated sympathetic response after shock and injury . Also, the activation of adrenergic receptors and releasing of CA play an important role in traumatic infections [84, 85]. Under physiological conditions, the activation of adrenergic receptors could alleviate the levels of pro-inflammatory mediators via the enhancement of IL-10 secretion. 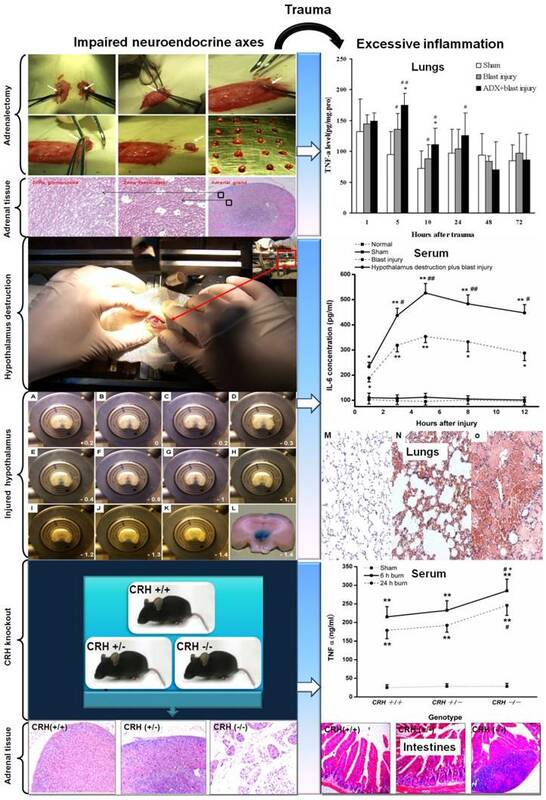 In the cecal ligation and puncture model of B6D2F1 male mice, the secretion of TNF-α and IL-6 in spleen macrophages obviously decreased after the 2 h treatment of epinephrine or IL-10 , while the treatment of ICI-118551, an antagonist of β2 adrenergic receptors resulted in the increase in pro-inflammatory mediators, demonstrating the expression of pro-inflammatory mediators in the peripheral tissues via epinephrine in the early phase of trauma. On the other hand, the sympathetic nervous system and gut-derived norepinephrine mediated the pro-inflammatory responses in kupffer cells in livers via the activation of α2A adrenergic receptors . Also, beta-adrenergic receptor activation by catecholamine of macrophages mediates the hemorrhagic shock / resuscitation (HS/R)-induced release of HMGB1, a late inflammatory mediator [29, 88]. Blocking this novel signalling axis may present a novel therapeutic target for traumatic inflammation. Thus, what effect the SAM plays for the inflammation outcome is closely related to their microenvironment and modulating measures. Regarding the key role of activation of adrenergic receptors and excessive releasing of CA, Wang et al postulated the theory of sympathetic excitotoxicity in sepsis . It was viewed that the paradigm shift of sympathetic nervous system activation determined the progression and outcome in inflammatory responses. Presently, results indicated that the activation of sympathetic nervous system could play anti-inflammatory effects, and even synergistic role with HPA axis and parasympathetic nerve system. But it generally occurs in mild injury or local infections. Once the severe traumatic infections happened, such modulating paradigm will be transformed from anti-inflammatory into pro-inflammatory pattern in sympathetic nerve system. Therefore, it is of great necessity to efficiently control the intensities and durations of traumatic inflammation for avoiding or containing the vicious cycle of sympathetic excitotoxicity, which is valuable for reversing the harmful outcome for infectious inflammation in trauma patients. The role of cholinergic pathway in injury has been investigated extensively owing to the anti-inflammatory capacity of vagus, the tenth cranial nerve stimulation as well as nicotinic acetylcholine receptor activation [90-94]. The increase of vagal tone is the significant representation in encephalon immune modulation. The efferent limb of vagus could alleviate the morality of septic shock by inhibiting the TNF-α secretion. Acetylcholine (ACh) is the principal neurotransmitters of vagus. Tracey et al named the anti-inflammatory mechanism as cholinergic anti-inflammatory pathway [95, 96]. The vagus expresses IL-1 receptor, converting the immune signalling to neuronal signaling through the ascending route of cholinergic signals reaching to the brain stem. Conversely, the descending route of vagus could modulate the peripheral leukocyte activity and inflammatory response via HPA axis and neuronal route inhibiting the secretion of macrophage cytokines . In addition, acetylcholine is also synthesized by lymphoid cells and suppresses macrophage activation in injury. Researchers showed that the electric stimulation of efferent limb and administration of a7 nAChR agonists [98, 99], which significantly inhibited the TNF-α production in livers, hearts and spleens as well as the reduction in the levels of serum TNF-α, alleviating the incidence of septic shock. Vagotomy and deficiency of a7 nAChR could obviously elevate the synthesis and releasing of TNF-α in inflammatory status, and enhance the animals' lethality in lipopolysaccharide challenge . Especially, the existence of pulmonary parasympathetic inflammatory reflex was also postulated concerning an acute lung injury model after local but not systemic challenge . In recent years, many anti-inflammatory drugs (aspirin, indomethacin, ibuprofen, CNI-1493, α-MSH, etc.) were found to excite vagus. The possible anti-inflammatory mechanism refers to the involvement of cholinergic anti-inflammatory pathway, which further supplies the robust evidence for the regulatory effects of neuroendocrine axes on inflammation [102, 103]. These findings deeply demonstrated that cholinergic anti-inflammatory pathway is the key defensive pathway for the specific inhibition of local excessive inflammation in trauma. Meanwhile, immune receptors and mediators, especially pathogen-associated molecular patterns (PAMP) and pattern recognition receptors (PRRs) have been involved in the regulation of neuroendocrine responses in trauma. Among them, CD14, scavenger receptors, toll-like receptor 4 (TLR4) and HMGB1 have been investigated extensively [11, 104]. The adrenal deficiency could significantly blunt the mRNA expression of SR-A, CD14, TLR4 and MD2 in injured lung tissues. Adrenalectomised animals showed enhancement of inflammatory responses and severe tissue injuries in trauma. The increase of CD14 after the pretreatment of corticosterone could improve the sensitivity of LPS stimulation. Also, the role of TLR4 acts as a crucial receptor in the innate immune system and their role in inflammation, stress, and tissue injury, including injury to the lung and brain have been clearly mentioned . TLR4 is involved in neuroinflammation due to the lung-brain interaction. TLR4 knockout and administration of a TLR4 antagonist (100 μg/mice) to WT mice ameliorate neuroinflammation due to lung-brain interaction after prolonged mechanical ventilation . Also, HMGB1-alarmin can be released from activated immune cells and from stressed and / or necrotic cells in response to tissue injury. It exerts its influence by interacting with several receptors, such as RAGE and some TLRs. RAGE and TLR4 transmembrane receptors are highly expressed in the lung and play an important role in innate immune inflammatory responses. The HMGB1-RAGE axis mediates traumatic brain injury-induced pulmonary dysfunction in lung transplantation . Notably, there have been at least 37 formally recognized cytokines and their receptors, and 60 classical neurotransmitters plus over 50 neuroactive peptides . So the complex modulation loops between neuroendocrine and immune responses in traumatic inflammation may be far beyond our research expectation. Additionally, another most fascinating aspect in lung inflammation is the crosstalk between the lung and other vital organs (brain, adrenal glands, intestinal ducts, etc.) through neural, cellular or humoral pathways. In that way, the work of Tracey KJ and the new findings of Gonzalez-Lopez on mechanical ventilation that trigger hippocampal apoptosis by vagal and dopaminergic pathways has been found . In other words, not only trauma or sepsis might cause distant inflammation. An impaired adrenocorticotropic hormone response as well as a significant increase for lung interleukin-6 were found, particularly in nonsurvivors compared with survivors among cecal ligation and puncture-induced mice . Therefore, the traumatic pulmonary inflammation should be further considered in uncontrolled neuroendocrine responses. Taken together, all of these modulatory circuits might integrate the lungs, immune and nervous systems and play a key role in regulating lung inflammation and immunity through the neural innervations in trauma. Actually, trauma belongs to a severe injury pattern followed with the immediate releasing of effecter molecules (hormones, neurotransmitters, neuropeptides, cytokines, complement, etc.). The aim of these extensive responses is to confront the potential danger in internal environment. The immunocytes (neutrophils, mononuclear macrophage, lymphocytes) may change their biological activities in response to these stressful hormones. Primarily, the releasing cytokines and inflammatory mediators could be controlled within a reasonable range in number and category occasionally through "neuroendocrine" G-Protein-Coupled Receptors (GPCRs) [6, 109]. Concerning the complicated neuroendocrine network as well as multiple hormones, neurotransmitters, neuropeptides and their targets, we could view that a certain magnitude of neuroendocrine responses may promote the relieving of the intensities and durations of traumatic stress from the point of biological evolution, which had been negatively confirmed by enhancing the risk of infections in injured animals with impaired neuroendocrine axes (adrenalectomy, CRH knockout, hypothalamus destruction) [11, 73] (Figure 2), relative glucocorticoids deficiency, glucocorticoids resistance, or circadian disruption of hormone release [110-112]. Moreover, once the intensity, frequency and duration reached above the threshold of auto-regulation, HPA axis and ANS will loss the coordinate regulatory capacity in an uncoupling state. Consequently, the regulatory effects of neuroendocrine responses may transform from the defensive state to the flight outcome [113-115]. The optimal regulatory response will finally disintegrate into the vicious or even paralysis outcome. The whole body responses will develop towards the uncontrolled directions. These trauma patients will undoubtedly succumb to the successive infectious complication. So, it is necessary to insist on the strategy of integrity, balance and space-time consonance for the treatment of traumatic inflammation on the basis of neuroendocrine immune network. Also, any efficient medical measures for the traumatic inflammation may help the rebalancing of neuroendocrine immune response. Only the stringent modulation of uncontrolled inflammation could avoid the traumatic complications and result in a favorable outcome for the trauma patients. On the basis of neuroendocrine immune network, we could easily found that the potential limitations existed in the therapeutic strategy of traumatic inflammation to some extent. First, within the experiencing treatment scope, doctors occasionally focus their procedure on the controlling of the source of injury or infection, rectification of the disequilibrium of water-electrolyte and the nutritional support. The severe stress owing to the somato- and psycho-trauma remains needed to attract the extensive attention. Results showed that appropriate neuroendocrine modulation may regulate inflammation to reach an optimum defense while preventing excessive host cell damage . However, the deleterious or malignant neuroendocrine cascade should be paid more attention especially for the trauma patients with potential infectious complications and exposure to some wretched circumstances . Second, growing evidence have showed that we have tried to control the inflammatory cascade via the re-balancing of pro- and anti-inflammatory responses as well as the recovery of immune state. However, it remains lack of insightful assurance on the intrinsic relations between the neuroendocrine and immune systems. Third, regarding the judgment of the pathogenetic condition and outcome for the trauma patients, most of the neuroendocrine measures depend on the level and reactivity of serum cortisol as well as dehydroepiandrosterone and its sulfate. Presently, it is in great need to form the evaluation system or personalized prewarning formula for the traumatic infections depending on the key parameters of neuroendocrine immune network. Fourth, we have paid a great enthusiasm on the west medicine while some Chinese traditional medical measures (acupuncture [117-120], Chinese patent medicine [121, 122], meditation [123-125], Taichi , etc.) in the neuroendocrine immune regulation have been attracted little attention . There are still many controversies that need to be resolved in order to use integrated traditional Chinese medicine-west medicine (tcm-wm) rigorously as therapy for trauma. Graphical abstract. Potential modulatory strategy for the rebalancing of neuroendocrine immune responses in traumatic inflammation. 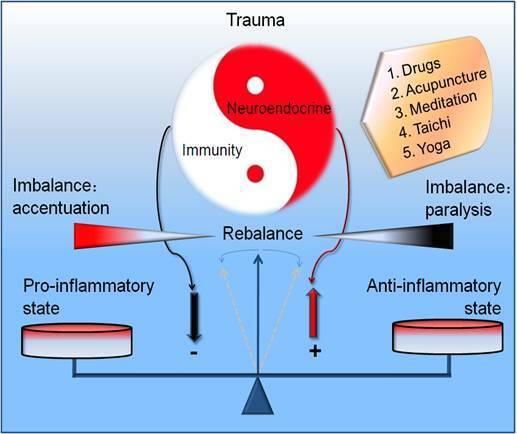 The ideal modulating measures emphasize the dynamic regulation between the imbalance and rebalance of neuroendocrine immune responses in a nonlinear manner in trauma. The drug and nondrug (acupuncture, meditation, taichi, yoga) treatment are recommended. Nevertheless, there has been steady progress in application of these methods of evidence-based medicine and modern neuroscience to these ancient practices. Since there remains lack of the stringent discrimination and rational regression for the modulation of traumatic inflammation, we need the global and dialectical idea from this ancient traditional medicine on the basis of neuroendocrine immune network, reconstructing the regulating network which was in chaos in traumatic infections, and recovering the physiological resonance. Such measures may be more efficient compared with the isolated organic function support and rigid structure repair. Collectively, it is of great importance to grasp the integrity of neuroendocrine immune network. The simple modulation of part of the network despite of the personalized occasion could result in the new inflammatory injury. Only the concordant and adaptive rhythm as well as their complexity and nonlinear regularity of these three systems  was realized can we grasp the ideal balancing point in traumatic inflammation (Figure 3/Graphical abstract). Undoubtedly, it is the key point for the remedy of traumatic infections. The insightful disclosure of neuroendocrine immune network has remarkably improved our understanding of how the excessive inflammation loses resonance in trauma. Through the dynamic and exquisite feedback loops and the circadian rhythm of key neuroendocrine-immune system, the uncontrolled inflammation may be pulled back into a standardized route. The inappropriate feedbacks of mediators may be wisely controlled to avoid a sustained inflammatory cascade that may have profound detrimental consequences depending on the tissues and the severity of trauma. The cross-regulation of neuroendocrine and immune system further endows them with the ability to stringently respond to various endogenous and endogenous stressful signals in trauma. The tightly regulated network comprising endoplasmic reticulum stress [81, 129], apoptosis and autophagy [130, 131], microenvironment regulation, post-transcriptional splicing , post-translational modifications and metabolic regulations [133, 134] is essential for the appropriate orchestration of traumatic inflammation and for the prevention of harmful traumatic complications (acute respiratory distress syndrome (ARDS), multiple organ dysfunction syndrome, (MODS)). Our knowledge of the regulatory mechanisms of neuroendocrine immune network will shed new light on the pathogenesis of traumatic inflammatory diseases and will further provide important clues for their diagnostic and therapeutic approaches. Several intriguing and important aspects of the balancing of neuroendocrine immune cycles are revealing the complexity of the links between the mind and the body although it remains elusive, and therefore present advantageous challenges for future trauma research. The authors thank Professor Min Zhao (University of California, Davis) for their critical reading of this manuscript. We own our best thanks for the devotion of Ader R, Blalock JE, Dinarello CA, Sharp T, Besedovsky HO, Kelley KW, Tracey KJ, Fontana S and Berczi I to neuroimmunoendocrinology. We also apologize for the omission of any references due to the space constraints of this review and wish to thank members of their laboratories for helpful criticism. This work was partly supported by the grants from Natural Science Foundation of China (81372105, 31271242, 81530063), the Special Funds for Major State Basic Research Projects (613307), and Medical Research Funding of PLA (AWS14C003). CY, XY, JG and JD drafted the manuscript; CY and JJ critically reviewed the manuscript. All authors read and approved the final manuscript.